Report by Chris Gee from the Singapore Airshow held in February 2018. This year, the Republic of Singapore Air Force has its 50th anniversary. For the global aerospace companies the exhibition is the place to showcase their products to the Southeast Asia Market. The most significant aerospace tradeshow and airshow in Asia took place at the Changi Exhibition Centre in Singapore 6th-11th of February. This biennial event attracts companies from across the globe to one of the worlds fasted growing regions for the defence and aerospace industry. Demand for Asia-Pacific carriers increased by 9.4% last year, while the last few years has seen some serious ‘up-gunning’ by armed forces across the region, making the event a fertile hunting ground for more business in the sector. The first four days, 6th-9th Feb were ‘Trade only’ days with the public able to attend on the 10th and 11th. The Expo offers companies, customers, end-users, media and industry professionals the opportunity to network in a neutral environment. Often companies save major business announcements for these airshows to make use of the heavy and holistic media presence. Having so many of your potential customers in one place makes investing in a booth at the expo a very efficient use of resources. As well as contributing actual aircraft to the show many of the exhibitors at the Expo went so far as to employ Virtual Reality systems to showcase their wares, alongside models, full-scale mock-ups, and multi-media presentations. The event schedule was packed with press briefings, seminars and lectures throughout the week. While this year’s event produced little in the way of new orders for the major manufacturers, there was a huge amount of activity in the realm of services and support. Some exciting new aerospace technologies were on show, alongside a terrifying array of emerging weaponry, with the global paradigm shift towards unmanned aerial vehicles and guided weaponry obvious. Boeing, Kawasaki, Embraer, Leonardo, Lockheed, Saab and Airbus all displayed models and brochures of their offerings, with some of the actual airframes, such as the P-8, A400M and G6000, appearing in the static display. Airbus had a huge presence at the event, highlighted by its newly certified, and very long A350-1000 XWB in the static display, as part of its demonstration tour of Asia and the Middle East. This aircraft is about to go operational with launch customer Qatar Airways and has proven to meet or exceed all performance specifications, especially the noise it produces, which now allows it to reach the stringent noise criteria for night-time operations into Heathrow. It also has better than expected airfield performance, while its smaller cousin, the A350-900, of which 142 have been delivered, has proved to have a remarkable dispatch reliability of 99.3%. Of particular interest was Airbus’s announcement that they are looking at offering a militarised version of their A320-Neo as a surveillance and maritime patrol platform, leveraging from their experiences with their successful A330 MRTT conversion. This is not the first time Airbus has talked about this, but the new Franco-German partnership in a fleet of new Maritime Patrol Aircraft to replace their Atlantique II and P-3 Orions was the exigence for the idea's resurgence. Airbus Helicopters showcased their H130 and H145 Helicopters along with the ‘H-Force’ modular helicopter armament system. Boeing announced $900million in orders for its engineering, maintenance, training and professional services at the event, yet most attention was on their NMA or ‘New Mid-Market Airplane’, a new concept aircraft likely to be called the 797 that offers high passenger capacity with high capability. Boeing has provisionally defined two versions: 225 seats with 5,000nm range, and 275 seats with 4,500nm range. Given anticipated fuel, production and logistics efficiencies this is a size of aircraft that is drawing a lot of interest from airlines across the globe. Singapore Airlines announced that the first route for their new 787-10 will be Singapore to Osaka. They will receive the first of 49 aircraft in March. Boeing confirmed the configuration of its new 737 MAX-10, with orders now standing at 416 Aircraft, the bulk of which are to be delivered to carriers in the Asia-Pacific region. They will enter service from 2020. Boeing and Singapore’s Defence Science and Technology (DSTA) signed an agreement at the airshow to collaborate in big-data analytics. The goal is to maintain and support systems more effectively, most notably for the Boeing systems that the Republic of Singapore’s Air Force utilises, i.e. : F-15SG multirole fighters, KC-135 tankers, AH-64D Apaches and CH-47 Chinook helicopters. Embraer had a prominent presence at the airshow, led by their beautifully painted E190-E2 prototype in the static display. The hand-painted ‘Tiger’ livery was a nod to their bullish ambitions in the Asia region. They also had their Phenom 300, Legacy 500 and Legacy 650 aircraft on show. Embraer announced one of the few actual new-airframe orders in the form of six KC-390 Multi-Mission Tactical Transports to aviation services firm SkyTech, which is a collaboration between HiFly, from Portugal, and Adagold Aviation from Australia. SkyTech plans to supply the aircraft to military customers under lease arrangements, with deliveries starting from 2020. Skytech will acquire the aircraft to full NATO specifications, including its Air to Air refuelling option. The biggest headline of the airshow was expected to be an announcement of Boeings take-over of Brazil’s Embraer, but while this headline failed to eventuate, it now appears a joint venture will be created, 80-90% owned by Boeing and based in Chicago, with Embraer’s CEO John Slattery as its COO. This will certainly put pressure on Bombardier who will see its two main competitors join forces, following on from the new deal between Bombardier and Airbus. After much domestic political hand-wringing over the deal, Embraer’s defence business would remain under Brazilian control and operate in Brazil itself, but with Boeing supporting the KC-390 internationally. Despite not having an aircraft on display this year, ATR scored the first airframe sales of the airshow with Thailand’s Bangkok Airways ordering four more ATR 72-600s. Nearly half of ATR’s current order backlog is from carriers in the Asia-Pacific region, yet they anticipate even more growth here, including selling their ATR 72-600F freighters to New Zealand’s courier and freight companies. As of today, there are 1,200 ATR’s in operation, 420 of which are in the Asia-Pacific, the largest proportion globally. Berjaya Hotels and Resorts also bought two pre-owned ATR42-500’s at the airshow, to service their two resorts on Redang Island in Malaysia. The highlight of Bombardiers presence at the airshow was the Air Baltic CS300 in the static display, the first time the type has come to Asia. Bombardier recently partnered with Airbus on the CS300 and announced at the event that integration with Airbus was going to be a top priority for the company, as they look to build an assembly plant together in the USA or Canada. The partnership follows a vicious legal battle and trade dispute that erupted after Boeing succeeded in getting a 300% import tariff applied to any of the Canadian manufacturer's aircraft sold to US-based carriers, citing government subsidies of Bombardier. Given America’s often forceful foreign policy that stops other nations doing exactly that, the irony of this case was lost on nobody. Canada cancelled its order for Boeing F/A-18 Super Hornets over the fracas, and then reached out to Airbus, who by siding with Bombardier absorbed a possible competitor while also ‘sticking it’ to their opposition. Bombardiers main competitor in the market of their CS100 and CS300 is Embraer’s E190/195-E2, whose coming arrangement with Boeing ups the ante a notch in the battle of the airframe OEMs. Outside the Bombardier pavilion was the Global 6000 business jet in the static display. This highly capable airframe forms the basis of the ‘Swordfish’ platform Saab is offering to fulfil the Maritime Patrol and Surveillance requirements. The fact that this incredible machine is at the spearhead of aviation technology was not lost on the RAAF P8-Poseidon aircrew that this author spoke to at the event. Bombardier also displayed a Philippines Airlines 86 seat Q400, a type that has seen considerable success in the region, along with a Challenger 350. The French manufacturer Dassault brought its Falcon 8X and Falcon 2000 LXS business jets to the static display this year. These latest generation aircraft sport incredible performance specifications, with the flagship Falcon 8X capable of travelling 12,000 km’s at Mach 0.9, enough to fly direct from London to Hong Kong, or New York to Beijing. The 8X’s Honeywell Primus Epic ‘EASy’ cockpit avionics resembles something out Star Trek, and takes so much workload off the pilot that their job is ‘hardly like a job at all.’ Let’s keep the originator of that quote anonymous, shall we? Gulfstream took up much of the tarmac in the show’s static display, with their recently certified G500 and G600 making their debut, alongside their flagship G650ER, G550 and G280. There are currently 330 Gulfstream aircraft operating in the Asia Pacific region, with the company optimistic about new sales. Gulfstream has been at the leading edge of Business jet design for decades, a position they reinforce with each new offering. At their stand the company was profiling their Special Mission derivatives, boasting more than 200 specialised aircraft in service with 40 countries. The event was the first showing outside Russia of the Sukhoi Civil Aircraft Company’s Sukhoi Super Jet 100 with new ‘Sablerlet’ wingtips, which reduce fuel consumption by 3%. The SSJ100 has also now been certified with more powerful SaM 146 engines, allowing it to operate from shorter runways, and additional fuel tanks extending the range to 4,300nm. By the end of 2017, there were 109 SSJ’s in operation with over 370,000 flight hours between them, despite punishing competition from Embraer’s E-190-E2 and Bombardier’s CS300. The Singapore Airshow is an important event for Sukhoi, who anticipate demand for at least 1000 aircraft within the SSJ100’s class within the next 20 years. 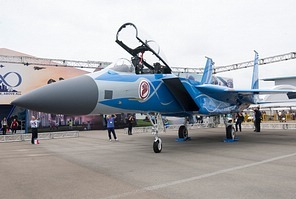 Chinese companies displayed an impressive array of aerospace and defence technology at the show, clearly showing their rise towards the leading edges of innovation within the industry. In the static display were two Medium Altitude Long Endurance (MALE) Unmanned Combat Aerial Vehicles (UCAV), the Wing Loong I and Wing Loong II. They were shown surrounded by, and loaded with, a formidable array of munitions and weaponry. The most interesting Chinese item on display, however, was a model of the ‘Star’ AT200 Cargo UAV, which are converted from Pacific Aerospace P750XL aircraft. The company advertises fully automated operations with a 1.5ton payload into unpaved landing strips of 300m, at day or night. The STAR representatives said they buy completed P750s and fly them to China, where they carry out the conversion to an unmanned platform. The behemoth that is the Singapore Technologies Group, comprising of ST Engineering, ST Aerospace and ST Kinetic had an immense presence, and their stand at the expo was literally jam-packed, especially on the public days since they were one of the few stands to stay open throughout the whole six days. From ultra-modern high-end armoured vehicles and naval shipbuilding, through to advanced sustainable ‘smart-city’ and transport initiatives, leading-edge aerospace and cyber technology, the ST stands was an impressive display of Singapore’s high-tech prowess. ST Aerospace subsidiary EFW announced a deal to convert ten A321-200 passenger aircraft to freighters at the airshow. They will have the capacity to carry 10 pallets in the lower deck, and 14 in the upper deck. This year’s event coincided with the 50th Anniversary of the Republic of Singapore Airforce, which was founded on September 1, 1968. To celebrate in loud and exhilarating fashion, a unique demonstration team was put together this year comprising one F-15SG and two F-16C fighter jets. Such an intense, close formation and flare-heavy display by dissimilar fighter jets was a sight to behold, especially given the F-15SG stunning RSAF 50th Anniversary livery. The three-way ‘opposing cross’ maneuverer in the display was a highlight, with a vertical climb in formation with long simultaneous flare release offering a brilliant finale. The RSAF section of the static display was impressive, with the aircraft loaded to the hilt with ordinance, and all with open cockpits that saw long queues forming as people got selfies in the aircraft. There was a strict ‘no cockpit photos’ rule in place, so RSAF personnel were on duty to take photos with people on their own phones and cameras. 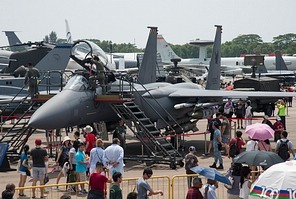 The line-up included three F-15SGs, with one in the anniversary livery, three F-16 C/Ds, two AH-64D Apaches, an AS332 Super Puma, CH-47SG Chinook, C-130H Hercules, S-70B Seahawk, Heron 1 and Hermes 450 UAVs and a G550 AEW aircraft. Despite much poking and prodding by this author, probably annoyingly so, there was no talk either way from the Singaporeans as to whether their plan to base F-16 or F-15 aircraft at Ohakea, New Zealand, has progressed any further. Given the limited airspace, the Singaporeans have in their home nation, much of the RSAF is deployed overseas for training, some of it permanently. The RSAF currently has Pilatus PC-21 trainers and AS532UL helicopters deployed in Australia, M346s in France, and AH-64Ds, CH-47s, F-16s, F-15s deployed in the US. From what this author could glean at the event, the deployment in Ohakea would be more of a permanent operational deployment as opposed to a purely training one, though the ability to conduct ‘combined-ops’ training with their land forces, who regularly deploy to Waiouru, was mentioned as a big factor. The RMAF Sukhoi Su-30MKM most definitely stole the show during the air displays, its thrust-vectored super-manoeuvrability sending it dancing gracefully through the air more like a ballet dancer than an 18-tonne fighter-bomber. Whether that ability is operationally useful in the modern context may be contentious, but it is indeed impressive to watch. The aircraft was thrown through flips, tail-slides, falling leaf impersonations, somersaults and its signature ‘cobra’ manoeuvres all the while dispensing what must have been its full load of flares. Of great interest was the RMAF A400M in the static display, one of 4 they have ordered. Airbus made good use of its presence, corralling a stream of delegates through the aircraft as they attempt to sway more defence ministries towards purchasing the aircraft. The sheer size of the aircraft is obvious, especially when it shares the static display with the C-17. The RTAF brought two Saab JAS-39C/D Gripen multi-role fighters to the airshow this year, with one giving an excellent flying display each day. These light, nimble fighters set the benchmark in capability vs affordability and operating cost, with the new ‘E’ version of the aircraft offering a world-class fighting capability with a purchase price ¾ that of a modern F-16 and half the flight per hour cost. Saab is very keen to sell this fighter across Asia and the Pacific, with interest in Indonesia, Malaysia and the Philippines. The biggest prize for Saab would be India, where they are offering not just the Gripen E for their MRCA competition, but also their ‘Sea Gripen’, a navalised version to operate from India’s new aircraft carriers. The TNI-AU’s Jupiter Display team, drawn from Training Squadron 102 based in Jogyakarta, performed daily precision formation aerobatic displays in their KAI KT-1B trainers. Their display was a huge hit with the audience on the public days. it was obviously new to much of the audience, since you could hear them scream in fright every time the aircraft performed close head-on passes, and the common ‘mirror’ manoeuvre received something of a standing ovation. The Australians brought their E-7 Wedgetail AWACS and brand-new P-8 Poseidon maritime patrol aircraft to the airshow. The P-8 crews were very forthcoming about how the platform differs from the P-3 Orion it is replacing. Interestingly, there is apparently little commonality in crew training and maintenance between the E-7 and P-8, despite both being based on the 737. The crew train together for 6 months then go their separate ways, with each having separate maintenance regimes. This was a good reminder that commonality is achieved through sharing systems and tactics, not the airframe itself. The P-8 is capable of long-range anti-submarine warfare, anti-surface warfare and intelligence, surveillance and reconnaissance missions, while the E-7A Wedgetail is primarily an Air Battle Management platform providing airborne control to fighter aircraft, that can also perform electronic warfare and intelligence missions. The United States of America loomed large this year, with a vast line up of hardware in the static display. A pair of US Marine Corps’ F-35B Lightning IIs made their Asian debut, while the USAF brought two F-22 Raptors, an E-3D Sentry AWACS, KC-135 Stratotanker, C-17 Globemaster III and RQ-4 Global Hawk UAV. The US Navy brought a P-8 Poseidon and F/A-18E Super Hornet. On Saturday afternoon a USAF B-52H from Guam performed a fly-by as part of a non-stop flight. The US Pacific Air Forces’ F-16 Demonstration Team performed the same display daily, flown by pilot Major Smeeding, with flares were being released at each twist and turn. The aircrew were all relaxed and talkative, despite the oppressive heat. The 2018 Singapore Airshow was undoubtedly world-class, offering a staggering array of aircraft. Yet aviation enthusiasts used to the style of other major airshows might have been slightly disappointed. Operating out of a major international airport such as Changi means that flying displays are restricted to just an hour each trade day, with two sets of 45mins each on the public days. The exhibition centre is off-airport, so the flying displays take place out over the water next to the venue and occur substantially further away than they do at other airshows. This means there are no opportunities to see the aircraft taxi, take off, or land. Photographically the usual ‘Asian-haze’ in the atmosphere creates a bright backdrop against which it is difficult to get a clear exposure, especially if the aircraft are dark themselves. Singapore is a very expensive city, and with the ‘Uber’ and ‘Grab’ companies banned from the event due to security concerns, sitting in the long queues in a taxi proved an expensive process. In hindsight, this author recommends getting accommodation closer to a train station rather than to the airport. It was unfortunate that the highly anticipated South Korean Black Eagles display team was forced to pull out of the flying display for the entire week. On the first day of the airshow, Feb 6th, one of their KAI T-50 Golden Eagle aircraft skidded off the runway on take-off, flipped and caught fire. The pilot walked away with minor injuries, but it was enough to ground the entire team. The runway was closed for several hours, which caused intense travel delays that reverberated across the globe.